In 2001, the Dexia Group (Dexia SA)  took over the Israeli bank Otzar Hashilton Hamekomi. It follows that the Dexia Group can be held responsible for contravening international law along with the principal shareholders of Dexia SA, the French and Belgian governments. 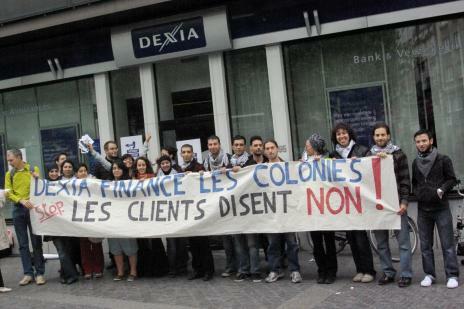 In 2008, Pierre Mariani, Dexia’s CEO justified this practice of financing the Israeli colonisation by claiming that the amounts involved were very small (1%). Nevertheless, these loans continue to finance the development of colonies in Jerusalem and the West Bank. What is more, Israel has enjoyed a period of strong economic growth and the amount of money invested to finance the colonies has also increased. Pierre Mariani, whose arguments have been exploited by the bank, considers the colonies to be simple local Israeli communities, although the UN Security Council has repeatedly condemned the Israeli occupation policy. Thanks to the actions of the "Occupied Palestine - Dexia Involved" platform,  which includes more than 80 municipalities, associations, political parties and trade unions, Dexia’s management is regularly questioned about Dexia Israel at its Annual Meeting of Shareholders. Contrary to Jean-Luc Dehaene’s declarations, new loans were granted in June 2009. At Dexia’s Annual Meeting of Shareholders in May 2011, the former Prime Minister announced the sale of Dexia Israel during the coming summer. An empty statement, which was, once again, not respected. Indeed, on October 29, 2013, he presented his report to the United Nations General Assembly. [http://www.intal.be/files/20131021_Richard_Falk_-_A_68_37" id="nh6-8">8] It is disparaging to Dexia SA and its shareholders, Belgium and France, revealing funding of illegal settlements in the Palestinian territories by Dexia SA through its subsidiary Dexia Israel. The UN Rapporteur urged those States to end the bank’s activities in the occupied territories, to punish those responsible, and underscored the possibility for the International Criminal Court (ICC) to investigate the involvement of French and Belgian Dexia personnel in war crimes. The report also states that Belgium and France could be held liable for damage caused by Dexia SA and sentenced to pay compensation and war damages. |1 Dexia Bank came into existence through the privatisation, during the 1990s, of public funding structures in Belgium and France. One of the principal actors, since the crisis, of a local administration financing scandal in France where it proposed over a hundred, often faulty and/or toxic financial products, to local administrations. It has currently been re-nationalized, as a rescue measure, under guarantee by the Belgian, French and Luxembourg governments and been, twice, bolstered with public money. Several associations such as ATTAC Belgium and CADTM have instigated legal actions against this guarantee. |2 M. David Kapah, director of Dexia Israel, made this explicit declaration before the Knesset finances commission on 19 June 2007.